Standing like a gingerbread dollhouse in the oldest stretch of historic Thornhill, Martin House Dolls welcomes Christmas shoppers out of the cold with a finely adorned tree and an elfin Saint Nick keeping watch for the naughty and nice. Though usually full with the largest high-end doll and bear collection in Canada, the dolls that call the small shop home have made way for their more festive cousins — some have even moved out entirely, adopted by new families. 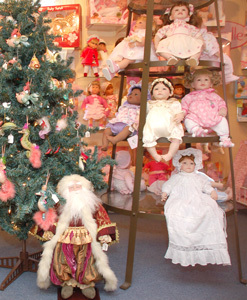 “(Christmas) is a key time of year,” says Kristine Sheffiel of Martin House Dolls, adding that it is the store’s busiest season. “Everybody is looking for things for their children. John Martin, a carpenter from Devonshire, England, built the house at 46 Centre St. in 1845. It was one of several he had built in the area, though this one was for his family, who lived there into the 1970s, Sheffiel says. The house was sold and converted into a general store before Martin House Dolls opened for business on March 30, 1985. “We’ve got to the point now, I mean we’ve been around here for 20 years, that the people who were just children when they first came in here now have kids of their own, and they’re coming in and buying things for their own children,” Sheffiel says. An 11-year employee and long-time doll collector herself, she says she’s loved her job since first joining Martin House. But, she adds, she’s lost track of just how big her own collection is. The same can be said for the stories Sheffiel has had the opportunity to see unfold during her time there. “We had this one little girl who came in and saw this doll that she wanted,” she says. “Her parents told her that if she saved up her money from the Tooth Fairy, she’d be able to afford it.